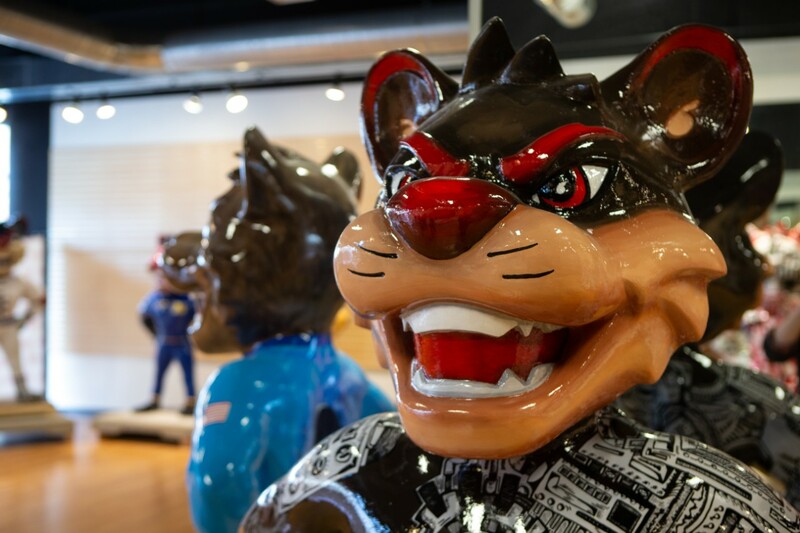 The masks are off: The University of Cincinnati unveiled 30 life-sized, distinctively decorated statues of its iconic Bearcat mascot Thursday as part of a new public art event launching this week across Greater Cincinnati. 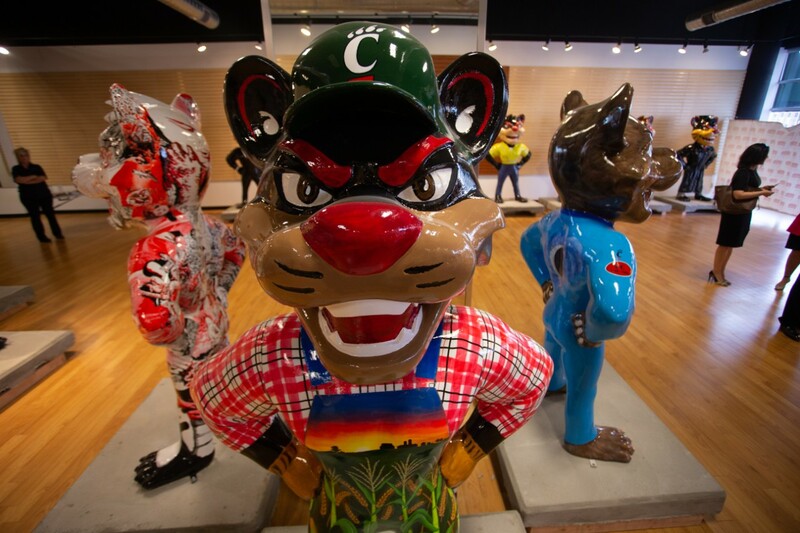 Hero Bearcats celebrates everyday heroes like astronauts, nurses, firefighters, police officers, farmers and others in colorful, whimsical ways, says Marty Ludwig, UC’s director of trademarks and licensing. The statues, decorated by local artists, including students from area high schools, will blanket the region for six months. You can find them at prominent locations across Greater Cincinnati from Florence to Downtown to Butler County’s Liberty Center. Ludwig says the creative campaign is designed to showcase the university’s impact on Cincinnati and beyond. UC, Ludwig points out, serves as an economic powerhouse for the Queen City, with more than 15,000 employees, 45,000 students, 300,000 living alumni and countless Bearcat fans. And among the state’s five counties in southwestern Ohio, UC generates a whopping $3.3 billion annual impact. The campus community is also credited with an $8.5 million annual impact thanks to volunteerism and community engagement. The Hero Bearcats exhibit not only celebrates local ordinary superstars, but the event itself provides a way for sponsors to serve as heroes for students and members of the community in need. Proceeds from statue sponsorships benefit student scholarships, the Bearcats Food Pantry and healthcare services for underserved members of the community. Kroger and UC Health are presenting sponsors of the campaign. These initiatives align with the Urban Impact platform of the university’s Next Lives Here strategic direction, launched in February 2018 to propel the university through the next decade and lead urban public universities into a new era of innovation and impact. 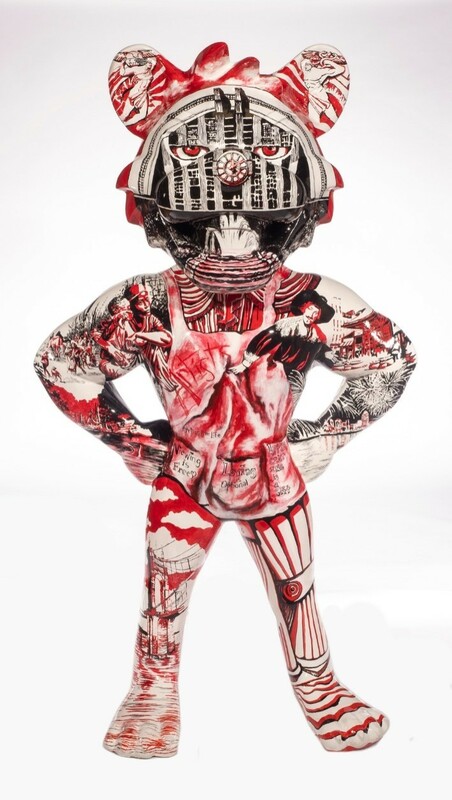 Thirty Hero Bearcats statues will grace the Greater Cincinnati region through September. For a map of all the Hero Bearcat locations, click here. When you see a statue, snap a photo or a selfie with it and post it to social media with the hashtag #HeroBearcats. UC’s most loveable and best recognized mascot’s roots were born during a formidable football game between the University of Cincinnati and the University of Kentucky on Oct. 31, 1914. To drum up support, cheerleader Norman "Pat" Lyon, introduced a new chant, using a play on fullback Leonard K. "Teddy" Baehr’s name: "They may be Wildcats, but we have a Baehr-cat on our side." UC won the day, 14-7, and a cartoon published in the student newspaper memorializing the victory featured a Kentucky Wildcat being chased by a creature labeled the “Cincinnati Bear cat.” The name stuck, and a legend was born. CCM Dean Stanley E. Romanstein has announced the appointment of Demarre McGill to the position of Associate Professor of Flute at CCM. McGill joined CCM’s faculty on a visiting basis in 2017. His new appointment will begin on Aug. 15, 2019.